Peter Bernhardt, Ph.D., a professor of biology at SLU and research associate at the Missouri Botanical Garden and the Royal Botanic Gardens and Domain Trust in Sydney, New South Wales, has been studying reproductive patterns in wildflowers in six countries for over 40 years and, like most dedicated scientists, thrives on new discoveries such as how bees respond to the color of the flowers they pollinate. "Remember how you were told that a dark coat keeps you a little warmer on a cold but sunny day," Bernhardt said. "Some plants blooming in chilly environments have dark purple or almost black patches on their flowers to keep cold-blooded insects toasty warm as they pollinate. Bernhardt said three years of research at their lab, with field work at Missouri's Cuivre River State Park and the Shaw Nature Reserve (owned by the Missouri Botanical Garden) illustrate a new side to this colorful tale in the online journal. Co-researcher Retha Edens-Meier, Ph.D., a professor and research scientist in SLU's School of Education, using thermocouples, and a hypodermic tissue probe, learned that these dark petals are up to 3 degrees Celsius (5.4 degrees Fahrenheit) warmer than the surrounding atmosphere when they stand in a pool of Spring sunlight. Bees, especially fuzzy females of Carlin's bee (Andrena carlinii), prefer to forage upside down on these flowers so their hind legs and bee butts are warmed by the dark petals as they drink nectar and collect pollen. "What is so unusual about these findings is that, when given a choice over two years, native bees preferred to forage on the concolor form so concolor flowers made more seeds compared to bicolors," said Bernhardt." 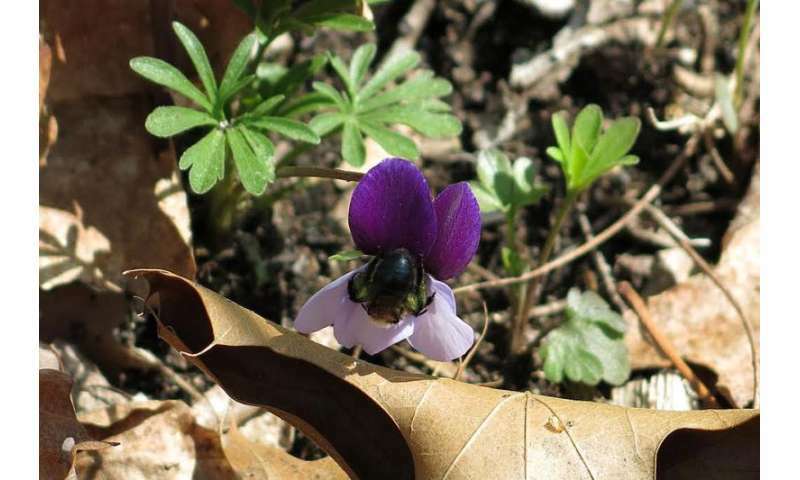 "Bird's-foot violets have an unusually broad distribution from eastern Canada through at least 30 American states. Research on these botanical beauties reveals interesting information valuable to ecologists, conservationists, and the general public," Edens-Meier said. "Although bird's-foot violets are not endangered within the United States plenty of other plant species are in significant decline." "Our goals are to investigate plant breeding systems and pollination ecology, especially in rare and threatened plants. As climate change continues to be responsible for out-of-sync bee emergence with flowering periods and bee-specific pollination events, pollination ecology has become an ever-increasing valuable field of study that helps us understand the ecological impact of these environmental changes. Through research and education, we can attempt to save our threatened organisms, one species at a time," Edens-Meier added.